Let's step back from the health risks of milk for a moment and examine what else is lurking in that white beverage. There are so many really nasty things in cow's milk that this post alone may convince you to stop drinking it, even if the other posts thus far haven't. For this post, we will be looking at normal, run-of-the-mill, pasteurized milk from the grocery store. 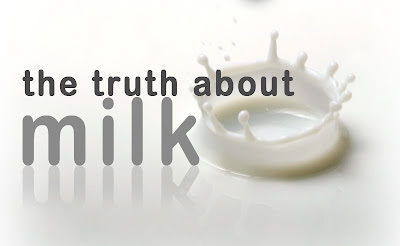 This post will not discuss raw milk, which has an entirely different makeup. Raw milk will get its own dedicated post on Monday. Since it comes from a living creature, milk can contain any number of substances that were present in the cow. Pasteurization does destroy some of these substances, but not all. This might get a little gross. What does pus do in the milk? Opinions on that vary. The FDA regulates it because excess amounts of somatic cells can decrease shelf life of milk and also degrade the flavor. Others site the fact that bacteria can use the somatic cells as a growth medium, pointing out that the pus makes bacteria grow faster. Pasteurization does not destroy somatic cells. So while the pus itself doesn't pose any specific health risks...do you really want to drink it? Milk is one of the best bacteria-growing mediums available. In a perfectly healthy cow, milk is sterile as it leaves the udder, but bacteria begins to grow as soon as it touches the air. Even after pasteurization, which kills most bacteria, the milk still has a long way to go before it reaches the grocery store. Plenty of time for new bacteria to flourish, even at refrigerated temperatures. Typical pasteurization involves heating the milk to 160 degrees for only 15 seconds. Ultra-pasteurization heats the milk to 280 degrees for a mere 2 seconds. But consider how we are told to sanitize water: boil at 212 degrees for several minutes. Pasteurization destroys most, but not all harmful bacteria present in milk. At room temperature, the bacterial content of milk doubles every 20 minutes. As this article explains, the bacterial content of milk, at room temperature, explodes and reaches maximum in about 20 hours. Certain bacteria present in a number of milk samples have been linked to Chron's Disease and a form of meningitis. Consider all this the next time you give your toddler a bottle of milk. This is a very commonly used growth hormone given to cows. It is called Insulin-like Growth Factor One. This hormone is given to cows to increase their milk supply, but it very easily passes through cows to their milk and is not destroyed by pasteurization. In fact, many studies indicate that IGF-1 content is actually increased by pasteurization. In humans, IGF-1 is known to cause a wide range of problems, from increased diabetes risk, hormonal imbalances, early puberty, immune system damage, and cancer. Believe it or not, American milk is banned in Europe unless it does not contain these growth hormones. It has been shown to promote breast cancer, increased liver weight, general weight gain, and many other problems. Milk without this hormone can be found in some places, however. It is usually sold at health food stores and will be labeled "NO rGBH." IGF-1 can also remain in the milk even after it's processed into cheese or other dairy products. We'll cover other dairy products in a future post. There could very well be other random stuff in the milk you buy at the grocery store. The thing to remember is that everything the cow eats ends up in the milk. Sometimes it's destroyed by pasteurization, sometimes it's not. Everything from feces, to pesticides, to whatever else might be on the ground. The clear message here is that milk contains a scary number of nasty little extras. From pus, which is very gross, but not very dangerous, to growth hormones which are very dangerous and cause cancer. These are things that you won't find on the ingredients list and yet are not to be taken lightly. The real conclusion is simple: milk is disgusting.